E-pistle 2008/15 – What’s In A Word? What’s in a Word? (Or why did the appearance of ‘Pure‘ on a label cause such a stink?) Some lateral-thinking mavericks in Diageo stirred the SWA (Scotch Whisky Association) into action a few years ago. The “Cardhu Pure Malt” controversy brought the category into sharp focus, but just why did the corporate machinations of Diageo kick up such a stink and get the malt connoisseur community (unkindly put down as anoraks) seriously agitated? It wasn’t a launch of an especially old and hideously expensive malt or yet another foray into wood finishes (yawn) or another consolidation of capital (via some take-over the value of a small planet) within the industry. Au contraire, this was at its deepest core of meaning about nomenclature, specifically what you could do with the words “Single” and the word “Pure” on bottle labels within the malt whisky category. The window of opportunity for a little bit of fancy footwork was afforded Diageo because the word “Pure” had been applied historically to both single malts (Glen Grant and Glenfiddich to name but two prominent examples) and vatted or ‘blended malt’ product such as in Hankey Bannister, Ballantines and Clan Campbell Pure Malts. What the Cardhu experiment was all about was manoeuvring a name on a label of an existing distillery (and by understood convention, guarantee of origin) into a mass brand, which was what got everyone including the SWA upset. What they were trying to do was about ‘blending’ or vatting (as I prefer) 100% malt whisky made from malted barley but coming from different sources and then placing it into the market bearing the name of an operational distillery, although Diageo did provide a little bit of tissue paper to cover the emperor’s modesty by renaming the distillery as Cardow. 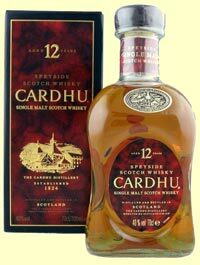 The underlying issue was about ‘branding’: about turning a previously understood guarantee of origin (distillery name) into a mass brand, basically by changing the word “Single” to “Pure” on the Cardhu label reflecting a decision to reposition Cardhu from a single malt to a vatted malt. There were all sorts of nasty accusations of “bait & switch” practices and a general brouhaha that Diageo couldn’t close down, despite their best efforts. The Cardhu manoeuvre was always likely to stir passions and you can understand why William Grant & Sons got so upset. The furore was never really about the fate of a mediocre Speyside, even if they were selling buckets of it in Spain? No; it was about a breach of tradition and the establishment of a precedent; this latter is critical; if they could do it to Cardhu, they could do it to distilleries that the malt whisky connoisseur actually cared about. And it wasn’t only about Diageo, although they copped all the flack- it was about stopping anyone trying the same strategy with any single malt distillery. Mind you, the denouement and the rephrasing of industry definitions which has resulted in the confusingly clumsy ‘blended malts’ might not have the marketing benefit that the SWA figured. However the ruling quoted above means that there is still the odd rock that the SWA hasn’t turned over. One that might exercise them at some time in the future is what are they going to do about Dewar Rattray’s little bit of necromancy with the launch of Stronachie – it’s a single and Stronachie is the name of a distillery, but a distillery that died and disappeared in the 1920’s, so again the name on the label isn’t a guarantee of origin. What’s next, someone relaunching Grand Tully or even Ferintosh? Whoops – I think someone’s already rattled the bones of poor Ferintosh!